Halloween and the premiere of Ash vs Evil Dead on Starz grows ever closer. 9 pm est this Saturday for those of you who are planning on tuning in. With deadite day coming up it’s time for the recap of the third movie in the original Evil Dead movie trilogy, Army of Darkness. This movie drops us right back where we left Ash in Evil Dead 2. Our chainsaw handed hero is somewhere in the past surrounded by knights and sand with no idea what’s going on. You’d think this would mean Ash could find a way to move on start a new life away from the evil cabin in the woods, but come on this is part of a trilogy, movie three is the place for all sorts of madness and mayhem. Not only has the movie started us off with time travel, but we learn Ash of course didn’t escape the deadites who were threatening his life and sanity. I mean they already got his hand, I’m sure they have plans for the rest of him. Army of Darkness does not disappoint. The 1992 movie amps up the camp and comedy with some hilarious dialogue and some super ridiculous, in a good way, action scenes. We get to see Ash attacked by his own evil doppelganger, mini Ashes, and an entire army of skeleton demon soldiers, knights, militant dudes made out of bones, whatever you want to call them. He also gets a chainmail hand because medieval dudes are super advanced and have the skills to do that. It looks cool, just not as cool as the chainsaw hand. While Ash starts off being seen as a danger he quickly rises back to his rightful hero position and even has a leading lady to woo. This movie has hilariously great effects which just make the movie. The dialogue in Army of Darkness is also the place where a lot of the most well known franchise quotes come from. Ash actually does a lot more talking in this movie than he has in previous movies. I really don’t think he gets to talk that much in Evil Dead 2 because he’s going crazy and in The Evil Dead he has some dialogue, but nothing that I remember standing out as super quotable. 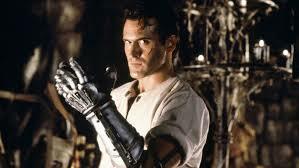 It has been a little while, but I really only remember key lines being in Army of Darkness. The ending of the movie shows us Ash back in the present telling his coworkers how awesome he is and saving them from a random deadite attack in a grocery store. 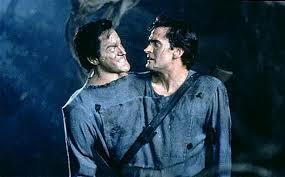 Live tweeting this movie was possibly my favorite of the three and you can find it in old tweets with #ArmyofDarkness. If you want to talk about Evil Dead, horror movies, Halloween, or anything else that strikes your fancy you can comment below or tweet at me, @kleffnotes, or at The Nerdy Girl Express run by the lovely Erin, @thenerdygirlxp. You can also find me on my blog, kleffnotes.wordpress.com, Periscope, @kleffnotes, or YouTube, I’m kleffnotes there too. I’ll be Periscoping tonight at 9 pm est and I’ll have a YouTube video going up afterward. Previous Previous post: It’s Chainsaw Hand Time Ash!